Combing sandblasting, painting and gilding with gold, silver and copper. You'll get dazzling results! This spectacular technique, called Verre Eglomisé, will add to your glass art repertoire in ways you've never before imagined. 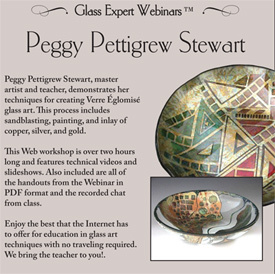 Peggy Pettigrew Stewart, master glass artist and teacher, shows you the step-by-step method for creating one of these unique works of art. This Web workshop is over 2 hours long, and features technical videos and slideshows. This DVD is suitable for both computer and DVD Player…so you can play it on your big screen tv!